Serving as a prequel to the previous two films, Paranormal Activity 3 details the early lives of sisters Katie (Chloe Csengery) and Kristi (Jessica Tyler Brown) and just what exactly sets the stage for their hauntings later in life. Conveniently father-ish figure Dennis (Chistopher Nicholas Smith) is a wedding videographer; and, as the hauntings of the family begin, Dennis decides to investigate further with his cameras positioned around the house. But, proving that things that go bump in the night often don’t want to be found, the investigation goes South, fast. Who will walk away, and why? As one who’s always skeptical of sequels and prequels I must admit the Paranormal Activity franchise has done a great job sticking with a basic premise and then exploiting that premise to a delightful and perfectly frightening degree. And, through exploitation of everyday materials and settings the writers and directors of this installment continue to bring the scares in unconventional ways, methods that will make you laugh after you’ve just screamed out loud. There’s still the implausible issue of why anyone would carry a video camera and tape everything as all hell’s breaking loose, seems to me, most sensible folks would just run. That aside, I laughed, I jumped, I squirmed in my seat, wanted to look away but couldn’t. Just in time for Halloween and worth seeing with a group of people. Paranormal Activity 3 is rated R.
Upon the death of his mom high school senior Ren MacCormack (Kenny Wormald) is forced to leave his life as a star gymnast in Boston and move in with his aunt and uncle in a small town Georgia. Exposed to the local politics Ren quickly learns that in an effort to protect the youth, the city council has banned dancing. Leading the Council decision is Rev. Moore (Dennis Quaid), the good revered also happens to be the father of bad girl Ariel (Julianna Hough). As sexual tensions rise between Ren and Ariel, there’s only one way to blow off steam, THEY’VE JUST GOTTA DANCE!!!! But wait….Ohhhhh, it’s banned, what can be done?! And, what about Ren’s best pal Willard (Miles Teller), will Willard ever get comfortable in his own skin to dance? Faithful to the original, this remake of the 80’s classic has me a bit puzzled. I’m still asking why? From the dances, to the costumes, to the music, the whole project has seen very little updating. Sure there are a few departures for glitz, glamour, and Hollywood awe, but, side by side there are more similarities than there are differences. So perhaps the effort is being made to tap into a fresh audience with new young faces? Perhaps, but this seems like the expensive way to go about doing things, then again perhaps the original just isn’t edited fast enough or flashy enough for today’s young audiences. Regardless, I also ask myself, was it fun, and was I entertained? Short answer, yes. Sure there are some serious logistical gaps, but we aren’t here for logic, we’re here cause we just gotta dance! Matinee for fun. 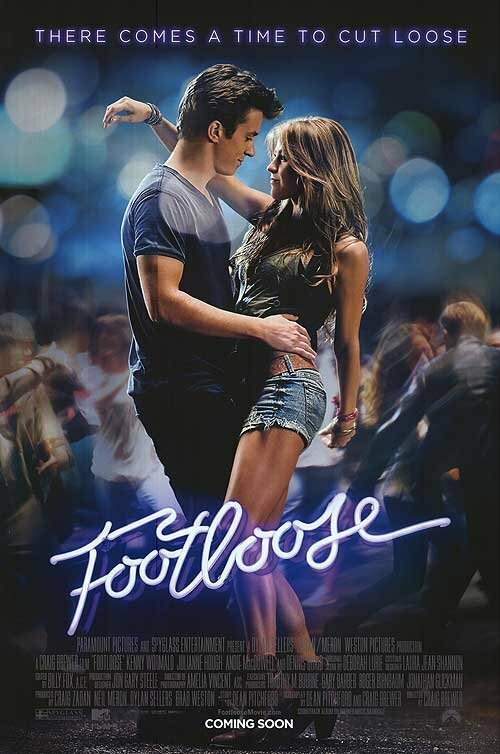 Footloose is rated PG-13. The year is 1982 and a Norwegian research team has just made the discovery of an alien spaceship in Antarctica. If that wasn’t enough, the body of a space alien has also been found encased in ice. But, the investigation turns sour quickly upon removing the alien from the ice. When “the thing” re-animates scientists and research aides are pitted against each other in a paranoid game of cat and mouse. Now it’s up to Kate Lloyd (Mary Elizabeth Winstead) and Braxton Carter (Joel Edgerton) to stop the thing from reaching civilization and destroying life on earth. 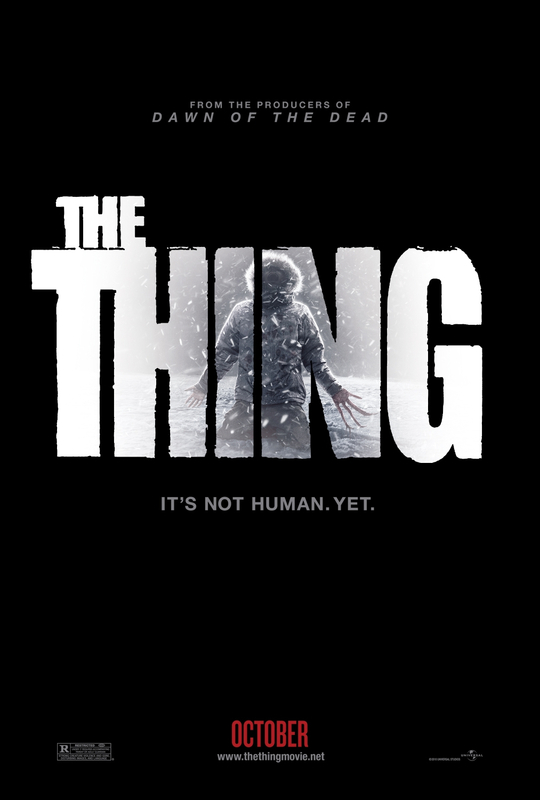 A prequel to master John Carpenter’s The Thing, which of course is a spin off the 1951 classic The Thing from Another World, we’re dealing with a story that has a rich history in sci-fi and horror– a franchise with moderate to high expectations from its audience. So how does this pan out? Aside from the tail end of the film that’s riddled with CGI graphics which are almost obligatory to horror flicks these days, I’m pleased to report director Matthijs van Heijningen Jr. has does a solid job creating a sense of paranoia and uneasiness that makes for a fun roller coaster just in time for Halloween. Much like a dark ride, you get in, buckle your seat belt, get a few scares, thrills, and bumps in the night and then you pop out on the other end with a smile on your face. Matinee fun. The Thing is rated R.